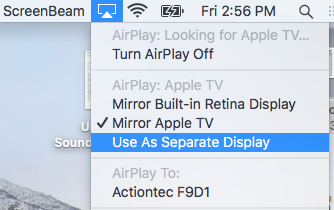 On the Menu bar, click on the screen mirroring icon, which is a small square with a triangle at the bottom. A menu will pop up with a list of available receivers. Click on the name of the ScreenBeam receiver at the front of the room from the list of receivers to connect to the receiver. Enter the corresponding PIN and click Ok. Copyright © 2019 Actiontec Electronics, Inc, All rights reserved.